This beautiful 1936 Ford chopped 3-window coupe was restyled by the Ayalas and owned – at one point- by Lynn Yakel. 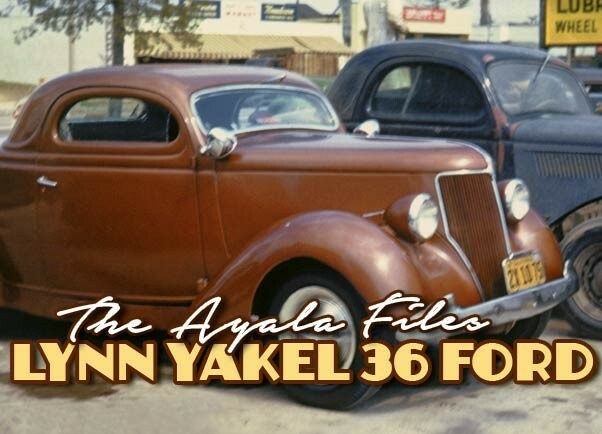 The Ayala shop have created quite a good number of Custom Cars in the 1940’s and 1950’s. Some of them have been featured in the magazines back in the day, or in more recent years. But we also know that a lot of their creations never made it into the magazine. For unknown reason the shop as well as the cars they created have never been capture in photos as much as for instance the cars created by the Barris Shop. Having less photos, and stories to go by, a lot of the Ayala restyled cars are surrounded my “mystery”. 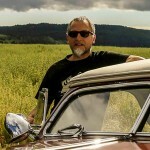 Many details about the cars and the owners have gone lost in time. Especially since so few photos have surfaced of their cars it is hard to find all the important details. One more Ayala Custom that is surrounded with mystery’s is the 1936 Ford chopped 3-window coupe we know as the Lynn Yakel 1936 Ford. 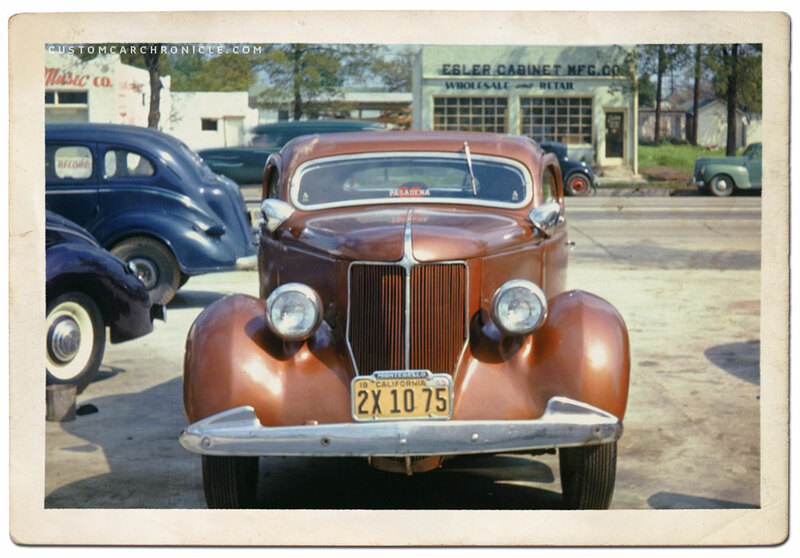 Fortunately we do have quite a few nice photos of this car, including some amazing color photos from 1948. But the information we have of the car is rather limited, and shows two names as the owners of the car. In the Authentic Hot Rods book by Don Montgomery (1994). a photo from the Carl Johnson Collection is shown with the ’36 Ford at an unknown dray lake event in 1948. The notes on the photo mention “Jack Carrol‘s old ’36“. The color photos in this article are dated April 1948 with Lynn Yakel as the owner. 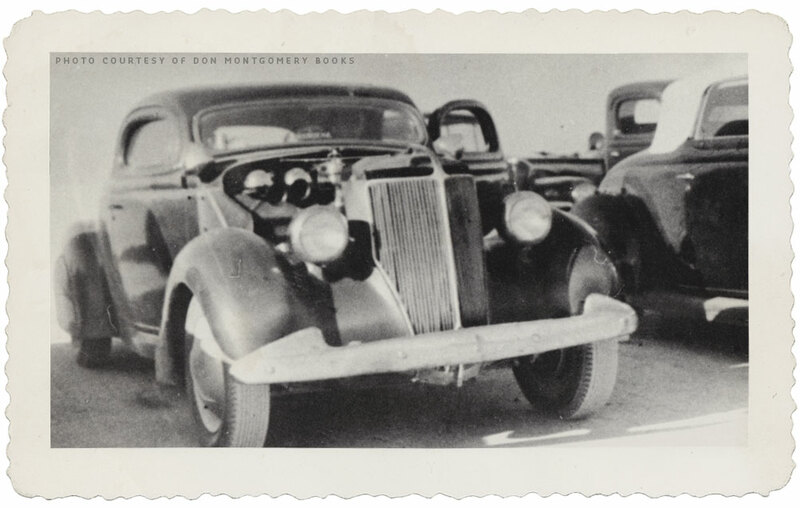 Don Montgomery also shows a photo of Lynn with the ’36 Ford at another dry lake event in his Hot Rods as they were book (1989), this photo was taken in 1949. The front view shows the molded headlight stacks, removed vents and double Appleton Spotlights. It also shows that two of the bolts on the 1940 Oldsmobile bumpers are missing. 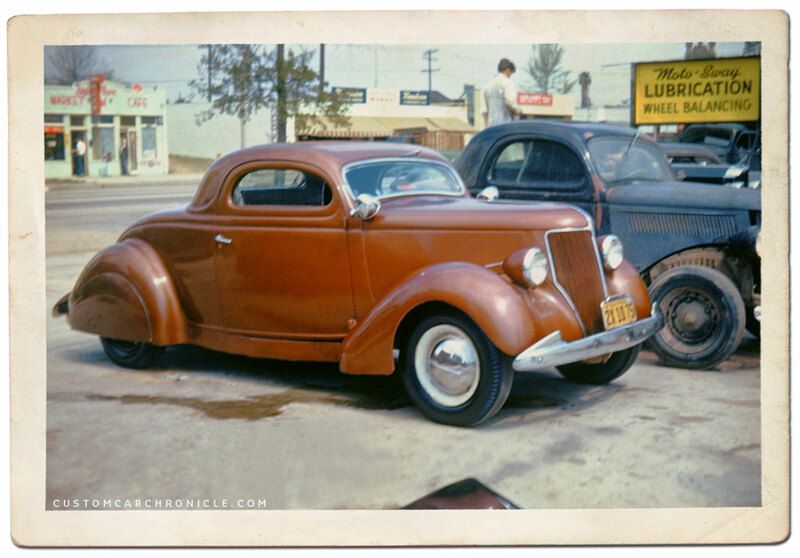 So either Jack Carrol had the Ayala’s Custom Restyle the 1936 Ford coupe before early 1948. 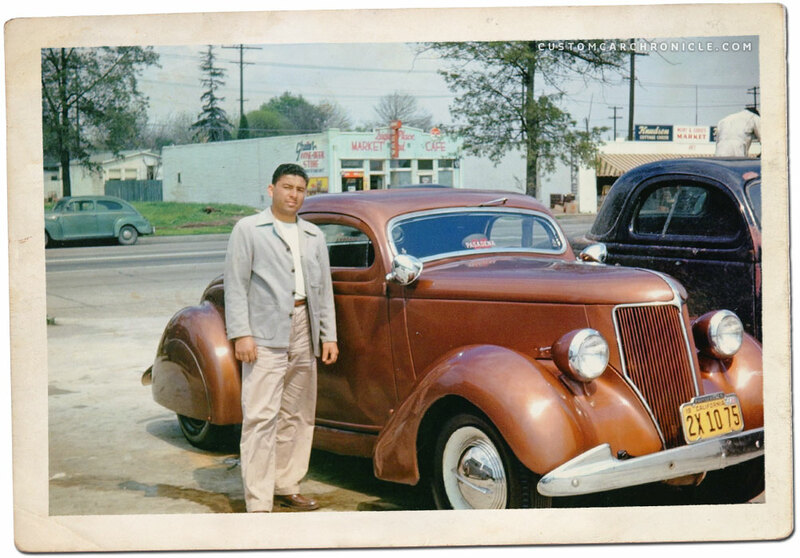 Or Jack owned the car originally and Lynn bought it from him and had the Ayala’s Restyle in before April 1948. In that case the color photos might have been taken from the car freshly done at the Ayala’s, or just shortly after Lynn had bought the finished car from Jack… So far we have been unable to find out the details on this. We know that Lynn was from Montebello, and the car runs a montebello license plate frame in the color photo from April 1948. But in the same photos we can also see the CC Pasadena (Pasadena City College) in the windshield, something done a lot in the 1940’s. We know that Lynn was a member of the Pico Rivera Hutters car club (next door to Montebello). Pasadena was a bit further away, perhaps Jack Carrol was from there? The side 3/4 view shows how nicely balanced the chop was. The car is typically restyled for the mid 1940’s. Rather high stance, removed running boards and black wall tires. The top has been chopped by the Ayala’s (listed as a 3 ½ inch chop). The Ayala’s also removed the running boards and added the frame cover below the main body. The front fenders have been modified at the front where the horn vents were removed and the headlight stacks were molded to the fenders and shortened a little so that the headlights could be mounted lower. At the rear of the front fenders the section where the running board used to be mounted to was reshaped and extend down. The hood sides were replaced with smooth units, most likely aftermarket units from Cal Custom or Eastern. 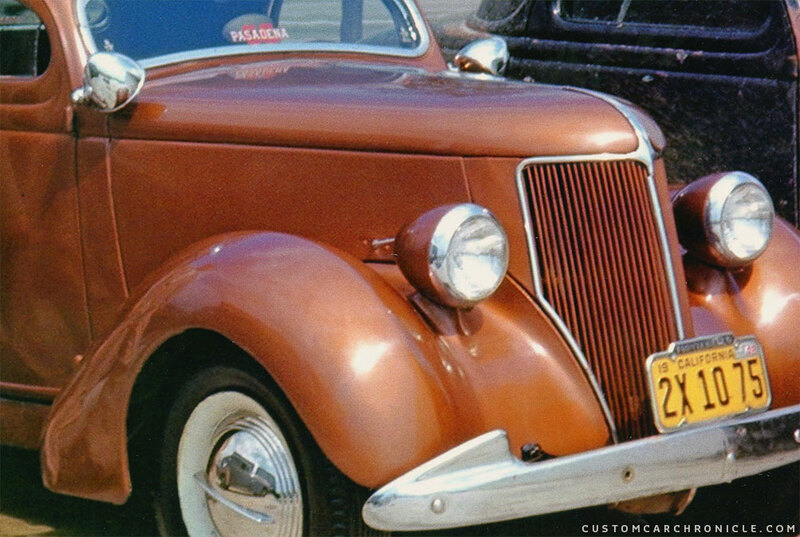 The stock bumpers front and rear were replaced with 1940 Oldsmobile units, a popular treatment back in the 1940’s. The rear fenders were molded to the main body and the body-bead around the fender was filled in for a smoother look. At the front of the rear fender the holes left from the running boards was filled and smoother. We have sadly not been able to find a photo showing the rear of the car. So we do not know what kind of taillights were used, and if perhaps the license plate was set in or not. 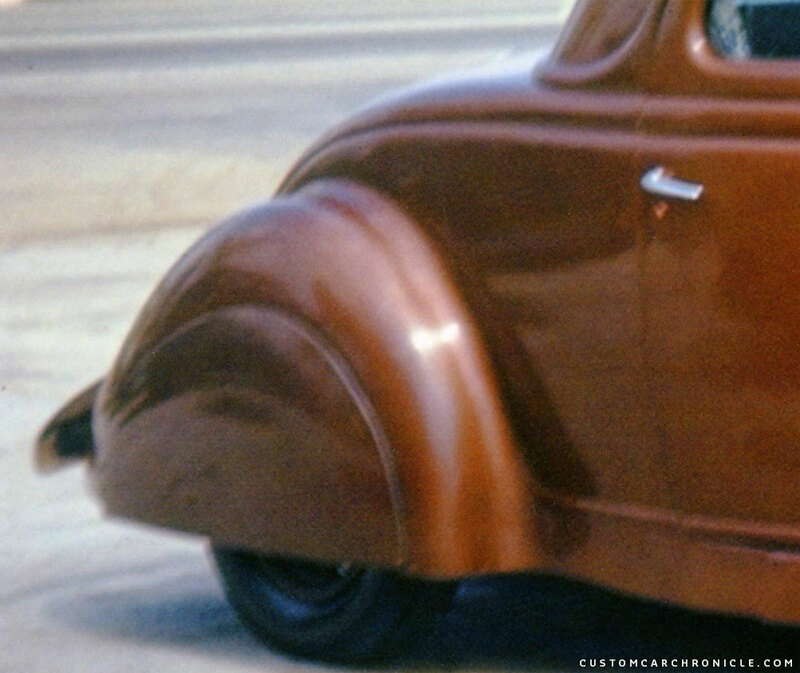 A pair of teardrop shaped fender skirts, possibly 1940 or aftermarket units were mounted, and a pair of Appleton spots was added to the A-Pillars. The car was lowered a little, not to much, and fitted with black wall tires with smooth wheel rings, (possibly Calnevar units) and single bar flipper hubcaps. 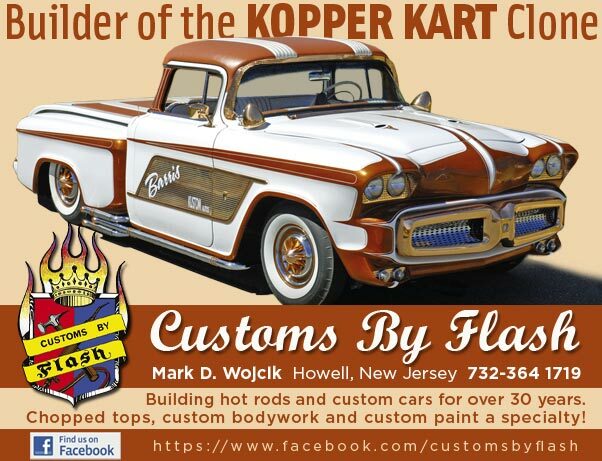 The car is listed as being painted the same color as Gil Ayala’s 1942 Ford Coupe. And that the car was painted by a guy named Rudy, who forked for Johnny’s Body and Fender a shop located next door to the Gil’s Auto Body Works on 4074 Olympic Blvd in East Los Angeles. Which does seem a bid odd, since Gil Ayala loved to paint the cars he and his brother Al had created. But who know… just more to add to the “Mystery”. 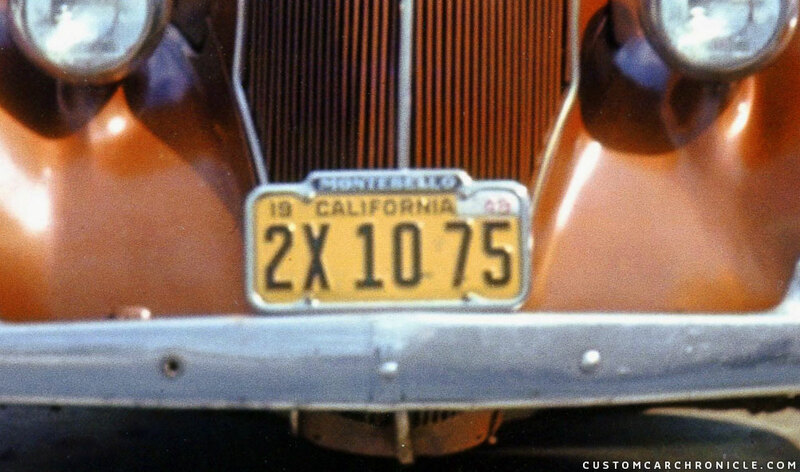 Close up shows the Montebello license plate frame mounted on the ’40 Oldsmobile bumper. Close up of the front sides show the smooth hood sides, the single bar flipper hubcaps and aftermarket smooth wheel rings. The car has also a bull nose aftermarket piece replacing the stock hood ornament. Close up of the rear shows how the rear fenders were molded to the body eliminating the lip around the fender on the rear quarters. Notice that the frame cover section also has been molded to the fender, and most likely also to the main body. We are not sure who the guy is in the photo, some have said that it was Gil Ayala. 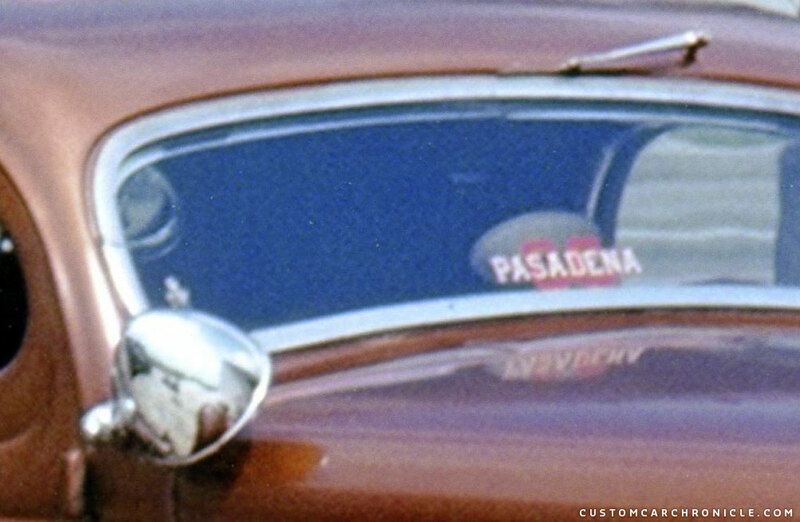 The white Pasadena letters on the windshield, and the red CC from most likely Pasadena City College (Thank you Manuel). 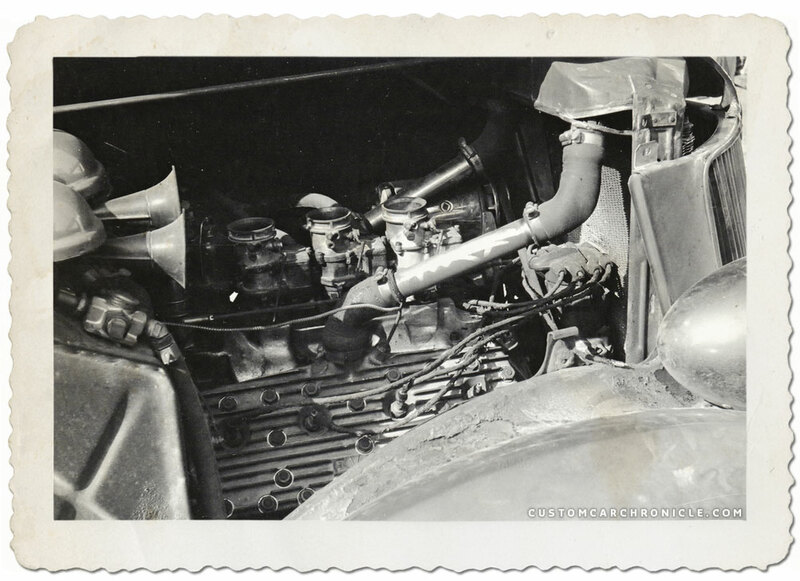 1948 Photo from the Carl Johnson Collection taken at one of the dry-lake events shows the car with the hood and hood-sides removed as well as the license plate. 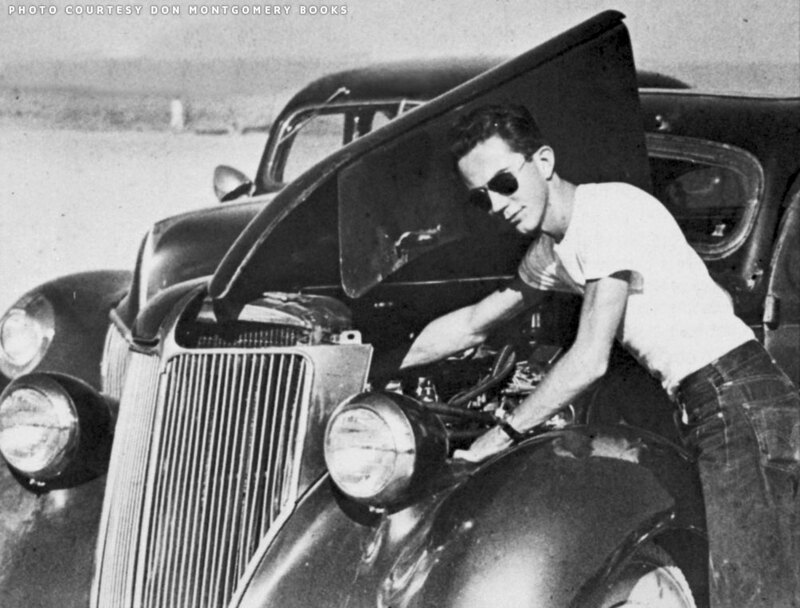 A note on this photo mentioned that the car was owned by Jack Carrol. Lynn Yakel working on his engine at one of the Lake events he attended. On October the 16th the mercury engine in Lynn’s Ford caught fire and damaged the front of the car at an El Mirage event. 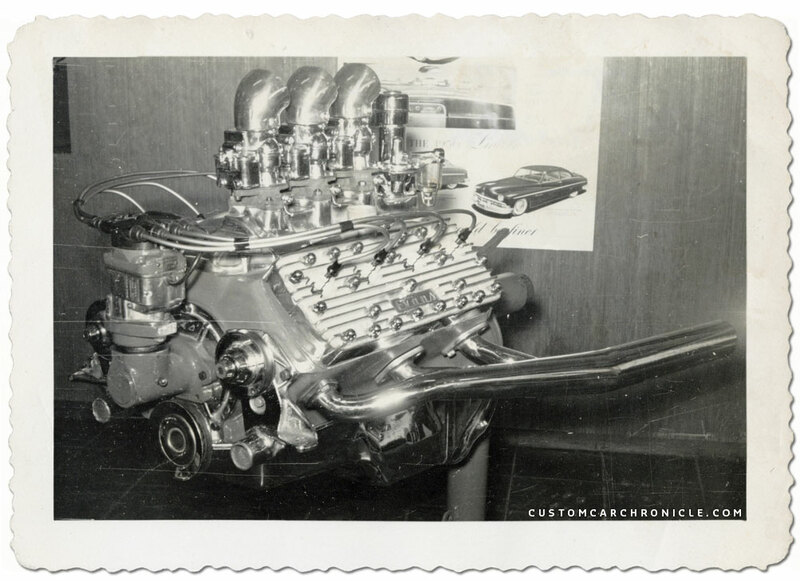 As far as we know the Ford had a powerful 284″ Mercury engine with Evans heads and a three carb intake, and the same engine later ended up in Lynn’s chopped and channeled 1932 Ford 5-window coupe. But before the engine was swapped the ’36 Ford was damaged a bit when the engine caught fire on October 16th at an El Mirage event. After that the engine was rebuild and most likely Lynn sold the 36 Ford. We have not been able so far to find out what ever happened to the car after 1949. Hopefully some of the CCC-Readers can fill in some more details about this Ayala 1936 Ford chopped 3-window coupe. Who was the original owner when it was restyled, and what happened to it after 1949? The fire damage was not so severe, and the engine was rebuild, and most likely reused in Lynn’s 1932 Ford. 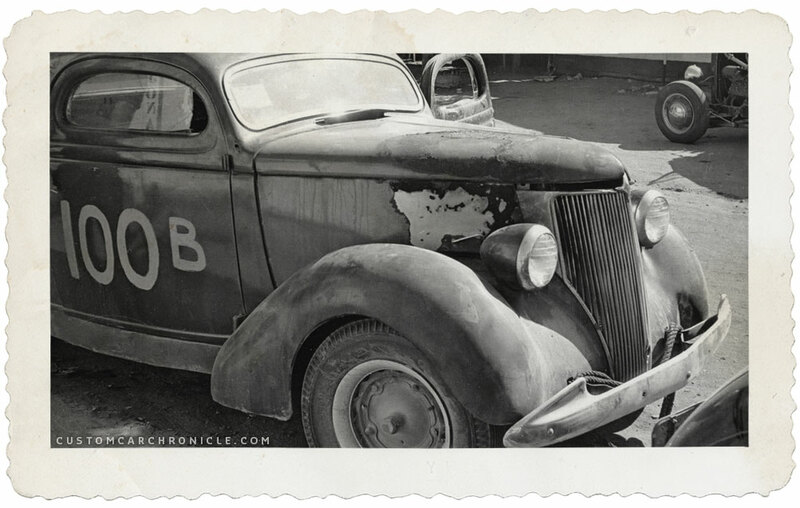 We do not know what happend to the ’36 Ford after this. The fully detailed engine completely rebuild after the fire. Really great early custom and wonderful photos. Thanks for sharing! Looks like a lot of cars were built on that driveway by all the oil stains, The 36 Ford parked beside this Ayala built car seems to have a very heavy lean to the passenger side…? Maybe it was wrecked on the passenger side and the fenders were used, On closer look at the close up photo the 36 missing its fenders looks pretty beat up for a 12 year old car. The decal on the windshield most likely stands for “Pasadena City College”. unfortunully they were fresh out of 36 3windows today but still amazing to find 70+ year old stuff to make traditional custom looking as close to amazing as this one icon !